There are so many great music festivals happening this summer that I just wish I would be able to attend. Case in point, the Pemberton Music Festival; a five-day festival taking place Wednesday, July 16 to Sunday, July 20 in beautiful Pemberton, BC (located near Whistler, BC) . 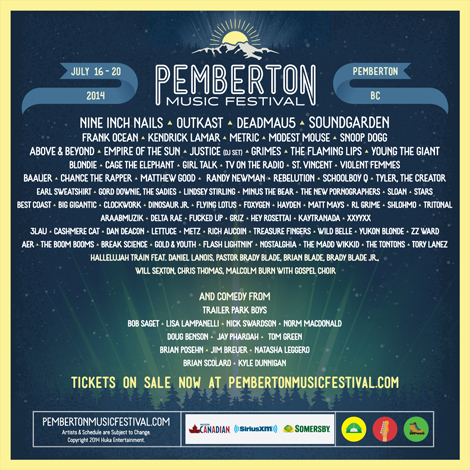 With nearly 100 performances and six separate performance areas, including two main stages, two secondary stages, a dance tent and a comedy area, Pemberton Music Festival will be five glorious days of music, comedy, and camping on 300 clean, open acres in one of the most idyllic settings on Earth. The stellar lineup includes the likes of Nine Inch Nails, Outkast, Deadmau5, Soundgarden, Frank Ocean, Kendrick Lamar, Metric with IMF favourites Justice [DJ Set], TV On The Radio, St. Vincent, The New Pornographers, Stars, Hayden, Matt Mays, Hey Rosetta!, Rich Aucoin and many more. For the full lineup, go HERE. Tickets can be purchased for the event HERE. Care of The Pemberton Music Festival, I’ve got two General Admission Tickets + Camping or Shuttle to give away to one lucky winner. There is only one way to enter. Email me at chris AT indiemusicfilter.com with “PEMBERTON” in the subject line with your full name in the body. Tell your friends in the west to enter! Deadline is WEDNESDAY, JULY 9TH at NOON (EST). I’ll notify the winner that day.